Goats Slaughter goats, Meat goats, live goats, Boer goats - Slaughter goats, Boer goats, Meat goats, feral goats have been one of the largest livestock segments for Capricorn Pastoral. 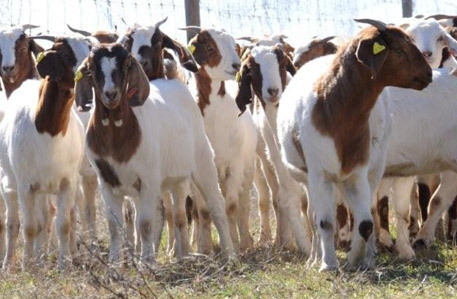 We provide pricing for Feral goats, Slaughter goats, Meat goats, Dairy goats, Boer goats. International Livestock buyers looking for prices for live goats should review the information with the latest news section. This information provides the latest prices for international export to several countires. Open pricing translates to our obligations to provide the best service to our clients. We are trying to create a better export system with our clients and believe that by providing goat prices on the website we are doing this. Boer Goats, Meat Goats, slaughter goats, feral goats have been one of the largest livestock segments for Capricorn Pastoral. We also source all types of Boer goats in whatever numbers you require. Exporting of goats both for meat and dairy has been a win-win for all parties. We select high quality livestock for export only and supply an animal guarantee policy. The company operates in a competive market but believes in high levels of customer service and trust. Many goat exporters in particular have created a poor reputation for delivery. We aim to maintain long term relationships based on mutual benefit. We have recently provided a more open pricing policy and believe we are the leading livestock exporter by air-freight.